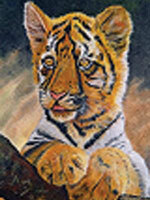 Charlotte Petriello is a long time Boulder City artist working primarily with oil paints. Like a lot of artists she has painted some watercolors and acrylics but her first love is oil. Mostly self taught from books and art shows on television, her first Art Award came when she was in junior high school and then again in high school, and she then became a member of the art fraternity at Marshall University. She found Steve Lesnick when she came to Boulder City and has studied several semesters with him. She paints a lot for kids. She painted gifts for the fair at Andrew Mitchell Elementary School and designed several logos for T-shirts. She had help from a lot of the students in making the final design. At that time the students at Mitchell called themselves “Junior Eagles” obviously reflecting their desire to get into high school and become an “Eagle.” Their choice was a logo with an eagle chick just hatching from an egg. 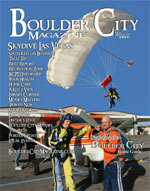 Charlotte has been an active member of the Boulder City Art Guild for nearly 30 years. During this period she has won numerous merit awards including a 3rd place judged by the late Cliff Segerblom, two theme awards, a 1st place and Guild award ribbons.